Two 25 year old sara LBS industrial doors have been replaced with new models, from the same manufacturer. The paper-based packaging company Smurfit Kappa has replaced the two older doors at its West Scotland depot. Smurfit Kappa had sales of €8.2bn in 2016, and is constantly innovating to create new packaging solutions and other paper based products, such as point of sale displays, and runs highly regarded recycling operations across the UK. Its depot in Uddingston, near Glasgow, serves the full breadth of Scotland’s economy - including medical equipment and whisky production - plus packaging for speciality products such as smoked salmon and other gourmet foodstuffs. Scotland also has a proud manufacturing sector producing goods as diverse as jet engines, computers, avionics and microelectronics, with Smurfit Kappa supporting almost all of them. The first new sara LBS door was fitted in the summer of 2016 and the second one, a virtually identical Sprint 355 model, went in during the early weeks of 2017. The installations took about two days each and included the building of new mounting frames. 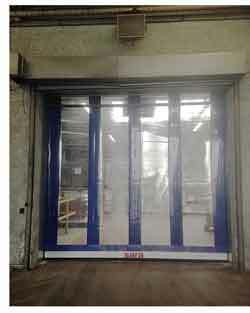 Both doors are clear PVC curtain doors, over 3m high and 3.5m wide, through which forklift trucks can freely pass. They are controlled by an induction loop that automatically opens the door as a truck approaches; operating quickly, but with a soft start and soft stop function to reduce wear and fatigue of the drive components. sara LBS supplies, installs and maintains loading bay equipment and high speed doors and roller shutter doors for industrial, production line, cleanroom and food processing applications. Its high speed range of 'Sprint' fast action doors offer the fastest operating speeds on the market and are ideal for most industrial applications. They are available in a range of models and can be customised for specialist duties such as machine protection, food processing areas and cleanrooms. Features which are exclusive to the ‘Sprint’ Rapid Roll range include the sara LBS non-contact travelling safety beam, which provides unparalleled safety for personnel and equipment, and the patented MCC Vector Frequency control system, as fitted to the Smurfit Kappa doors. The Sprint 355 high speed roller shutter door is suitable for both internal and external use in applications where frequent operation is required. The high visibility transparent curtain enhances safety while the high-speed 'rapid roll' capability protects against vermin and minimises energy loss and draughts – a very attractive attribute in a Scottish winter. The Smurfit Kappa doors open and close at speeds up to 2.5m/s, meaning the can fully open or fully close in about 1.5sec. In anticipation of a long, hard working life, sara LBS has fitted the Smurfit Kappa doors with vertical reinforcing strips and strengthened edges. Other options offered on the Sprint 355 include aluminium barrel covers, bottom rail and side frames, and a strong cover for the drive motor, a Bowden lever for emergency opening, and a curtain tensioning system for smooth and steady movement. They can be integrated with traffic light controls when used in loading bay installations.